Solid hardwood is among the best of all flooring materials. Sourced from 100-percent renewable materials and capable of multiple refinishing, solid hardwood is a classic floor covering that contenders like laminate and engineered wood can only hope to match in terms of beauty and function. But solid hardwood does have its downsides. One notable drawback is that it transmits sound vibration. Hardwood is dense but often it is not quite dense enough to absorb all of the vibration found in a typical home. In a multi-story house, it is common to hear the footfall of people walking overhead on hardwood floors, especially when those people are wearing heels. Is it possible to add soft, thick padding under a wood floor to mitigate sound transmission and improve overall performance? Is any type of intervening layer recommended? Paper or felt are two materials that are traditionally installed between hardwood flooring and subfloor. These materials help minimize squeaking that may occur between the bottom of the floorboards and the top of the subfloor. However, paper and felt do not actually absorb sound in any meaningful way, nor do they make the surface any softer to walk on, in the same sense that foam underlayment does with laminate flooring. In lieu of soft underlayment, it is possible to lay down a solid underlayment that is specially designed for absorbing sound. SoundEater, made by Impacta, is one type of solid underlayment that can be installed under solid hardwood flooring. SoundEater is described by the manufacturer as a "free-floating underlayment designed for nail down hardwood flooring." In this case, the underlayment does not need to be nailed to the subfloor, but the hardwood planks will be nailed down to the underlayment. 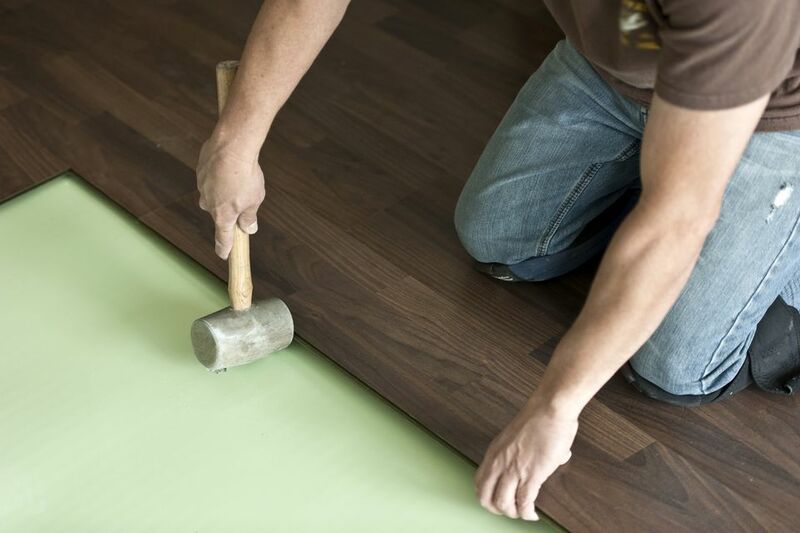 Rubberized membrane is a thin (90 mil) laminated product that is so all-purpose that it can be installed under floor coverings ranging from solid hardwood to thinset-based ceramic and porcelain tile flooring systems. An example is Proflex90, a peel-and-stick rubberized fabric sheet product that can be used under finished hardwood floors. This membrane is waterproof and it offers a limited degree of sound control when used with hardwood floors. It is installed over the plywood underlayment just before the hardwood flooring is laid. While soft, thick underlayment should not be installed directly under solid hardwood flooring, it is possible to do this when there is an intervening layer of plywood. With this type of application, a dimpled underlayment such as DMX 1-Step is laid on top of the subfloor. Directly above is a sheet of 5/8-inch plywood or OSB, then the solid hardwood flooring. Solid hardwood itself does a remarkably good job of absorbing sound. Some wood floors often referred to as hardwoods are actually softwoods: pine, spruce, cedar, and fir. At the very least, be sure to choose true hardwoods such as oak or walnut. For even better sound absorption, look toward denser exotic hardwoods like mahogany or Brazilian cherry. Adding fabric rugs and runners will go a long ways toward eliminating the sounds of footsteps on hardwood floors overhead. They have the added benefit of protecting hardwood surfaces against wear and tear. Many homeowners have a shoe-free policy. Removing outdoor footwear at the front door keeps homes cleaner, reducing the frequency of sweeping and mopping. But it also makes for a quieter home. Sound within rooms and between rooms is greatly reduced. Building or buying an attractive shoe storage unit and providing slippers are two ways to encourage guests and residents alike to drop their shoes at the door.